Mrs May needs Parliament to approve her deal, but had to pull a vote on it after it became apparent that a coalition of left-wing opposition politicians, the Democratic Unionist Party (DUP) which props up her minority administration, Brexiteers in her own party, and even some diehard Remainers would not back it, paving the way for a landslide defeat. This was followed by her own MPs triggering a vote of no confidence in her leadership — which she survived after promising to step down before the next General Election, but badly damaged, with around a third of her parliamentary party and more than half her backbenchers (MPs who are not on the payroll as government ministers) backing the call to oust her. She had hoped a whistlestop tour of EU capitals and a summit in Brussels would allow her to secure some sort of legally binding concession on her deal’s contentious “backstop” — which would see Great Britain indefinitely confined to an effectively EU-controlled “single customs territory” and the British province of Northern Ireland economically annexed by the bloc, with no power to end the arrangement unilaterally — but was slapped down in humiliating fashion. “We don’t want the UK to think there can be any form of renegotiation, that is crystal clear,” announced the European Commission’s unelected head, Jean-Claude Juncker, at a press conference following the summit — as journalists began to release that draft conclusions of the meeting had been amended to delete the passages offering some warm if ultimately substance-free assurances to the British. “We can add clarifications but no real changes. 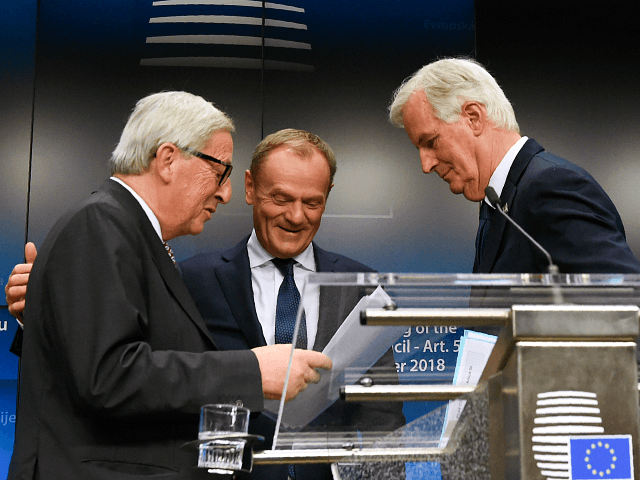 There will be no legally binding obligations imposed on the [EU by] withdrawal treaty,” he declared. Juncker also suggested, as Brexiteers have long suspected, that the Remain-voting Prime Minister and her europhile adviser, Olly Robbins, have not really made it clear what they want from Brexit — if anything — telling his audience: “Our UK friends need to say what they want, instead of asking us to say what we want. Tusk: The Union stands by this agreement. It is not open for renegotiation. Donald Tusk, who dropped his job as Prime Minister of Poland shortly before his “centrist” party was crushed at the ballot box by the conservative-populist Law and Justice Party (PiS) to take up a better-paid role as the unelected President of the European Council, was equally forthright, declaring that the Brexit deal “It is not open for renegotiation”. Mrs May, however, has so far remained silent, at least in terms of public pronouncements, following up her failed meeting on December 13th with a one-on-one with the embattled but fanatically europhile French president Emmanuel Macron on the morning of December 14th. It has been for EU leaders, rather than the May government, to up the ante and announce that they are accelerating preparations for a “No Deal” Brexit — which would see Britain leave the bloc without a formal agreement and deal with it on standard World Trade Organization (WTO) terms, like Australia or the United States — with Brussels set to publish its full plans of December 19th. “Very objectively, the signals that we heard [from Theresa May] yesterday are not especially reassuring about the capacity in Britain to be able to honour the engagement that was undertaken,” Belgian prime minister Charles Michel, explaining why No Deal preparations were being stepped up. Irish leader Leo Varadkar, who has been particularly pusillanimous throughout the negotiations, even went so far as to appeal to British MPs over Mrs May’s head to either delay or revoke the Article 50, the EU treaty clause activated by the British government almost two years to begin the countdown to Brexit Day in March 2019.